Translation: Shri Ram was born on Chaitra month, 9th Tithi (Navami) in the bright half (shukl paksha) in Abhijit muhurta (around noon when Sun is in 10th house). It was neither too cold nor too hot. It was an auspicious time giving peace and solace to the all the 3 worlds (lokas). According to Ramayana written by Sage Valmiki the birth of Shri Ram is as follows. Translation: On completion of the ritual, six seasons have passed by; then in the twelfth month, i.e., in Chaitra masa, and on the ninth day of that Chaitra month [April-May], when it is Punarvasu Nakshatra yukta NavamI tithi, i.e., when the ruling star of that ninth day (thithi) is Punarvasu, for which Aditi is the presiding deity; and when five of the nine planets – Sun, Mars, Jupiter, Venus, and Saturn are exaltated and when Moon and Jupiter are together in Cancer Lagna (ascendant) and when day is advancing, Queen Kausalya gave birth to a son with all the divine attributes like lotus-red eyes, lengthy arms, roseate lips, voice like drumbeat, and who took birth to delight the Ikshwaku dynasty and adored by all the worlds, and who is the greatly blessed epitome of Vishnu, namely Rama. Master archer (Dhanurdhar), very knowledgeable and determined warrior. Protector of Brahmins (holy people),women and mankind in general. An Ideal king who has lot of compassion for his fellow citizens. (Maryada Purushottam) upholder of righteousness (dharma) and social norms of highest order. A peace loving, spiritual, honorable and wise personality. Self sacrificing person, who kept his personal interest below the interest of respected elders (like parents and gurus etc) and state. Time when polygamy was prevalent He upheld the dharma of one marriage in one lifetime and was completely devoted to his consort mother Sita. Lord Shri Ram was born in Caner Ascendant (Lagna) with lagna lord Moon and 6th lord and 9th lord Jupiter is in lagna. Moon and Jupiter in mutual quadrants that too in Lagna and in quadrant from Arudha Lagna makes a very powerful Gaja Kesari yoga of fame beyond death. Indeed the lord is famous and remembered since (Treta yuga till today in Kal yuga). Jupiter being 6th lord and 9th lord is placed in Lagna with Lagna lord Moon. (Lagna is the most auspicious house as it is a trine and a quadrant both) this placement with Moon in lagna makes Jupiter a benefic of highest order for the native. Being the 9th H lord the primary focus of Jupiter is to enable native uphold his duties (dharma) and because it is exalted it will make the native do it very happily. Being the 6th lord in Lagna it directly brings enmity and obstacles (6th H) to his head but he will emerge victorious because of his luck/fortune (9th H) and own morals and principals (1st H). The native because of this will bring some problems for himself and his close ones and they may suffer because of it but will not let anything bad happen with others. He will also take those challenges as his duty. (Maharishi Parashara has also taught that Moon, Jupiter and Mars are benefices for Cancer ascendant. Jupiter being a 6th lord if also owns a trine it gives auspicious results. Here Jupiter owns 9th house and is with lagna lord Moon. Venus and Mercury are malefic planets for Cancer Lagna, they will make the native struggle. Moreover Venus is Badhaka for Cancer Lagna :-Jatak Parijaata. Yoga karaka Mars (5th lord and 10th lord) is forming Raj yoga with Jupiter (9th lord) and Moon (lagna lod). Yoga formed by mutual aspect of planets (as they are present in 7th H from each other). This gives rise to most powerful Dharma Karma Adhipati Yoga for Lord Shri Ram. It is the combination of 10th lord (work, here Mars) and 9th lord (righteousness or dharma, here Jupiter) that are strongly connected with lagna lord Moon. Hence his ideals and principles, his actions (karmas) in the world will be governed by welfare and righteousness of highest order. Above all the Raj yoga forming planets are friends (Moon, Jupiter and Mars), this makes it even stronger. It also gives rise to some other important yogas like Guru-Mangal yoga ( Jupiter and Mars yoga), Chandra-Mangal yoga (Moon and Mars yoga) and Chandra-Guru-Mangal yoga ( Moon, Jupiter and Mars yoga). Raj yoga is formed by union of quadrant and trine lords only. Quadrants are ruled by Lord Vishnu(signifying constructive efforts and karma) and Trines by Maha Laxmi (signifying fortune, blessings and good results with less efforts). Translation: In the thee worlds (lokas) I do not have any prescribed duty or It is not necessary for me to do anything in the three worlds (lokas). Also there is nothing in the three worlds that I wish to achieve/acquire and I can not do so. Yet I am engaged in my karma and doing my duty. So must all do their selfless Karma without focusing on results/fruits. Jupiter in Lagna has Dik Bala (directional strength) and grants the native blessings of Ishana or Shiva(the deity ruling dik or direction of Jupiter in Dik Chakra). With the blessings of the deity, the native has highest wisdom and knowledge and will always behave in accordance with them. Before the commencement of War with Ravana, Shri Ram prayed to Lord Shiva in Rameshwaram for seeking his blessings for victory. Exalted 9th lord in Lagna makes the native very much liked by father and or gurus. His father was in great love with him and wanted him to rule Ayodhya after him (the kingdom of Shri Dashrath, his father). The gurus and rishis used to demand him and his younger brother to save them from autocracies of demons. Jupiter and Moon in Lagna makes native a very peace loving and wise personality by nature who would use violence as only the last resort to any problem. Jupiter is lord of one bad house (of enmity and overcoming the obstacles) and one good house (9th H of dharma and righteousness) to uphold values and follow good path in life. He always followed dharma and sacrificed his interest and did what was correct in life. All the fights/wars that he fought were for just and righteous causes: right from killing various demons who were creating problems for rishis and people of his state (mankind) to killing Ravana, who abducted his spouse forcefully. Shri Ram has 2nd lord Sun exalted in 10th H in Dik Bala (directional strength) makes the native victorious in all his pursuits. In Dik Chara the concerned deity is Indra, who is always victorious. Shri Ram always conquered all his enemies in battles and wars against non righteous people. There are 5 exalted planets in the chart giving rise to Samrata yoga. Shri Ram was indeed a king of high order. The Janma Nashatra (birth constellation) of Lord Shri Ram was Punarvasu, the symbol is: Bow and a quiver of arrows. 1. Birth in a royal family: Surya Vanshi. Belonging to the lineage of Sun god. Birth of his consort, mother Sita in an elite royal family and she being a very vitreous and beautiful lady. Arudha Lagna represents the status and image of the native in society at the time of birth. Lord Shri Ram has Arudha Lagna in Aries, its lord is Mars. The planet is exalted confirming his birth in a very high class family and grants the native high status in the society. Note: Just as the status of the spouse is seen from UL (Upapada) in the same way status of the person is seen from AL (Arudha Lagna). Translation: If Lord of Upapada (UL) is exalted, spouse hails from elite/upper class. Reference: Brihat Parashara Hora Shastra by Shri Sanhtanam. Chapter 30:Upa Pada. Translation: If lord of Upapada (UL) or Venus (sthir karaka for wife is exalted) then wife is from noble family reverse is true. If 2nd house from Upapada (UL) has benefic and 2nd lord is exalted, the wife of the native will be endowed with beauty and virtues. All conditions sated by Maharshi Parashar and by Maharshi Jaimini are fulfilled. UL lord (Mars) is exalted and Venus is exalted as well, There is benefic Mercury in 2nd house from UL and 2nd lord form UL, Venus is exalted as well. Ne doubt that mother Sita was very beautiful and vitreous lady and Ravana wanted to posses her. Exalted Sun is in Arudha Lagna giving him royal status of a King. He was born in a royal family (because of Mars) and his own karmas were such that he further increased his name and fame because of exalted Sun in Arudha Lagna. Exalted planet (a friend of Moon) if in Arudha Lagna, will give very high status and very positive image to the native in society. In this case both the planets associated with his Arudha Lagna are of warrior class (Kshatriya : Mars and Sun) so is his image in the manifested world is that of a great warrior, ruler and Ideal king (Raja Ram: King Ram). Exalted Sun in AL gives royal status and very high spiritual image as well. 2. Breaking the Shiva Dhanusha (bow) and marrying goddess Maha Laxmi in the role of mother Sita during Sita swayamvar. In Sita swayamvar (the custom that allowed young princess to chose her husband at her free will) the qualifying condition for groom was to break the bow of Lord Shiva (Shiva Dhanush). Shri Ram broke the Shiva Dhanusha in a fraction of second which all other participants could not even move, proving his might. All the love/physical partners are represented by A7 (Dar pada) and the spouse with whom person settles down in life is shown by UL (Upa pada). All planets placed in 7th house from any arudha will block, oppose or create obstacles in the path of that Arudha. The lord of 7th H from any arudha will help rise that arudha if it is strong and well placed (exaltation sign, own sign, mool-trikon sign etc). In the contrary case it will block or create obstacles for that arudha. Who will block or oppose will be seen by the Natural significance represented by planets or Naisargik Karaka Tatwa of the planet for the native. The planet placed in 7th house from UL as well as the 7th lord form UL represents the relative of the spouse and not that of native. When considering other things represented by Naisargik Karaka Tatwa, (other than relatives) it is the same for all. If there is no planet in 7th house from from UL and 7th lord from UL is placed in an enemy’s sign or is in debility, then that relative of the spouse (represented by 7th lord from UL) will oppose the marriage. Example: If UL is in Gemini and there is no planet in Pisces, and 7th lord Jupiter is in enemy’s sign or is in debility, then the elder brother of the “to be spouse” can be the opposition to the marriage. Primary food for thought on this aspect is from Atri Classes taught by Pt. Sanjay Rath in his free lectures. Reader may want to refer his teachings. All variations readers find here are that of authors own understanding only. All planets placed in favorable sign (own sign, exaltation sign, mool trikona sign etc) in 7th house from Arudha Lagna will help rise the status of the person. They will contribute in the success of the person. If they are weak or ill placed (debilitation sign, enemy sign etc) they will create lot of opposition for the person and hence person will have hard time in getting his work done /raising his social status. Weak natural malefic planets like Sun, Saturn, Mars, Ketu and Rahu (kroor grahas) will create great obstacle for Arudha Lagna (image) to rise. Weak natural benefic planets ( saumya grahas) like Venus, Jupiter, Moon (sukla ashtami to Krishna saptami) and mercury (not influenced by malefic) still try to do some good for the native. The lord of 7th H from Arudha Lagna will help rise the image of the person if it is strong and well placed (exaltation sign, own sign, mool-trikon sign etc). In the contrary case it will block or create obstacles for the native. Lord Shri Ram, has AL, A7, and UL all together in 10th H and there is exalted Saturn in 7th H from them. According to above stated rules. Exalted Saturn will create big obstacles or challenges for his UL (marriage) and A7 (intimate relationship) but will surely help rise his Arudha (his own image or AL). Maharishi Jaimini gives a clear indication that Saturn is Naisargik Karaka for a bow also in the following Updesha. Translation: Saturn alone in 5th H, produces an archer. (Navamansh Kundali (D9)). There was a big challenge in his way for his marriage with mother Sita and it was to break very heavy Shiva dhanush (bow). This obstacle was put in place by the family of the bride (mother Sita). It was such a great challenge that all other fellow participants could not even move it. For the image of Shri Ram (Arudha Lagna) this Saturn behaved very favorable so Shri Ram could break the bow in two pieces in a fraction of second proving his great might and immense strength over all other contestants. Saturn being a malefic planet by nature gave difficult situations but always proved to be good for Shri Ram personally. It was association of two other Arudha (A7 and UL) with his AL that made this marriage possible. More over it was the presence of exalted Sun (Blessings of Lord Shiva) with the three arudhas that enabled him to marry his consort (Maha Laxmi). Exalted Sun in UL behaves like a benefic for Upapada and help to manifest it in the material world, the marriage actually took place in front of the world. 3. Declaration to the world as 7th incarnation (Avatar) of lord Vishnu and depart of Shri Parshuram as 6th incarnation of Lord Vishnu (end of the karma, as 6 avatar). When Shri Ram broke the Shiva Dhanusha (bow), the 6th Incarnation of lord Visnhu Shri Parshuram appeared in the ceremony and challenged Shri Ram to use his bow (given to him by lord Vishnu) and launch an arrow to prove his superhuman might as Lord Vishnu. Again the exalted Saturn (bow and arrow) in the 7th H from Arudha Lagna of lord Shri Ram enabled him to do this task very easily there by helping him raise his status from a normal prince to the 7th incarnation of lord Vishnu. Lord Shri Ram shot an arrow to kill the egos and anger of Shri Parshuram with his consent leading to his depart as 6th incarnation of lord Vishnu. 4.Exile in forest for 14 year after marriage, just before his swearing in ceremony for the kingship of Ahodhaya. Opposition caused by the presence of younger brother, whose mother (Shri Ram’s step mother) wanted his son to become the king. She played her cards well and forced the king (Shri Dashrath) to accept her demands. Younger step bother (Shri Bharat) was in agony and frustration because of the evil act of his mother and even cursed and miss behaved with her over the entire incident. Shri Ram accepts the verdict of his father (King) and peacefully departs for exile in forest (Vanvasa). Kingship, rajya pada (A10) for Shri Ram is in ascendant with powerful Moon and Jupiter making it very strong and famous. The karaka of younger brother, Mars is in 7th from A10, his formal nomination as the King. So this Mars will create tremendous opposition for his A10 or will obstruct it fully. Also this Mars is in 7th house, Marana Karaka Sthana (death signifying house) making his younger brother Shri Bharat feel like dying because of the evil and selfish act of his mother. Shri Bharta loved his elder brother Shri Ram very much and wanted him to rule the Kingdom. Shri Ram as A8 (Mritu pada, ascoated with suffering and or transformation) in 12th H with debilited Ketu in it. Indicating that lord will have terrible suffering in faraway places from his mother land (foreign), also. Mars and Ketu are plants of sudden developments, hence these events taking place quite fast. 5. Wandering and living in forest along with wife and another younger step brother Shri Laxman for 14 years, continuously helping rishis and killing demons. Other younger brother (Shri Bharat) ruling the throne by keeping his slippers on the throne. Lord Shri Ram has 2 benefic planets in Lagna indicating his pure and pious intentions and personality but dire malefic like Saturn in the 4th H will give him lot of sorrow in life. Saturn being enemy of Mars (karak of house and property) will rob Shri Ram’s happiness of house and other comforts. There is Sarpa yoga in his birth chart, with the presence of 3 malefic in 3 quadrants. The native will be tormented in his life because of various circumstances and consequently will have suffering in life. In his horoscope, there are also 2 benefic planets in Lagna (ascendant) yoga. They will surely nullify the effects of sarpa yoga but to some extent. Saturn is exalted 7th lord from A10 (his kingship) so he will enable his kingship manifest in the world. Also Saturn is in the 7th H from AL, so he will prove helpful in flourishing his AL (Own Status). Saturn is also karaka of 12th H (foot). His younger brother placed Shri Ram’s slippers on the throne in his absence and ruled as his representative during his 14 year stay in forests. The two planets that manifest his kingship ( rajya pada or A10) are Moon and Jupiter in Lagna. 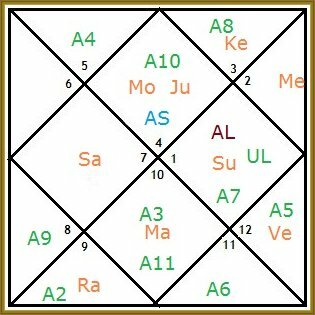 These plants have Argala on 12 th H having (A8, suffering), the 10th H having (AL, own image), 9th H having (A5, following) and on 3rd H having no Arudha but which shows younger siblings. By carefully examining all these factors the Moon and Jupiter combination is more powerful and also Mars is yoga karaka planet ( owning a quadrant and trine) and hence it will finally make the A10 ( kingship) become reality even in his absence in Ayodhya. Shri Raam has Exalted Sun in 10 th H. From an early age he had Raj yogas. The strength of Su is seen to see the quality and degree of Raj yogas in the Chart. As it is present in 10 th house it will happen early in life. Also the Moon is very strong in the chart, which is necessary for the sustenance of Raj Yogas. He became the King quite early in life and continued to remain one with no opposition at all for his entire life time, except once. Though his formal coronation took place after his return from exile. 6. Abduction of mother Sita by Ravana. The declaration of war by Shri Ram on Ravana on the account of irreligious and immoral act (adharma) he did by abducting mother Sita forcefully. In the end victory over enemy and return to Ayodhya along with his consort mother Sita. One possible explanation is: 6th is the house of enemy and loss of marriage or staying away from spouse, so if that planet is in Lagna then this situation is coming to head of the native. From 6th house of enmity as lagna, lagna lord is in 8th H indicating enemy putting very hard work to torment the native. The Lagna is maraka sthana (7th H) for 7th House (spouse) or relationship of the person. So enemy is tormenting the native and breaking his marriage. Also in this case A6 (the tangible manifestation of enmity/enemy) is in 8th house from Lagna. 8th house is the house that destroys the marriage or killer (maraka) for marriage (2nd and 7th are maraka house from any house). In this particular case manifestation of enmity (A6 is in 8th H) destroying the spouse relationship for the native (7th House). Jupiter being 9th lord as well and is placed with lagna lord Moon, making the native fortunate because of luck and own ideals and he is undefeatable because of presence of dik bala Sun (Indra) in 10th H.
Venus is most malefic planet for the native of Cancer ascendant being a natural benefic and 4th lord and lord of 11th house. 7. Separation with mother Sita on account of charges levied by a dry cleaner (dhobhi) that mother Sita had stayed in the custody of another man (Ravan) for many days without the consent of her husband and hence should be abandoned on moral grounds as she is no more chaste. Shri Ram accepted this verdict as social/state law prevalent at that time. They did not divorce or separate officially but mother Sita went away and started living in the ashram of Sage Valmiki to protect the honor and dignity of her husband, Shri Ram. 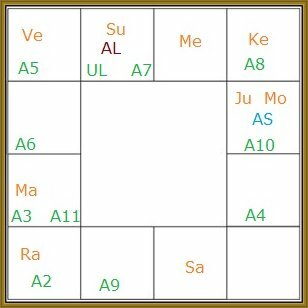 Lord Shir Ram has Brahmin’s curse (sharpa) in his chart as Jupiter, representing brahmin or guru and is aspected (graha drishti) by Saturn and Mars both. The Brahmin who gave this curse (sharpa) was Dev Rishi Narad ji. He was very angry (Mars) and very sad (Saturn) as lord Vishnu did not let him marry a girl he liked. So he gave lord Vishnu a sharpa that as he has suffered for his loved one in the same way lord Vishnu will suffer in one human life for his beloved spouse. Saturn (karaka of labor class or common man also represent a servant or one involved in profession requiring labor like cleaning and washing) is separative by nature it is in the 7th H from UL generating great obstacle for marriage/wife there by leading to their separation. Venus as 7th lord from AL will do all what is necessary to make rise all the three arudha: AL+A7+UL. Also the Venus is 2nd lord from the 3 arudhas so he will sustain Lord Shri Ram’s image and their marriage both. Venus is natural significator of wife (Naisargik karaa) so the wife will do all good for the three arudha: to make them rise and sustain them. But this Venus is in 12th house from AL. So we can say that wife (Venus) is not destined to see the rise of great status of Shri Ram as King of Ayodhya. More over the planet is exalted hence wife will sacrifice herself happily for his sake. One can also say that as Venus is in 12th H from AL of Shri Ram so he will be forced to ignore his spouse (pure and pious love, exalted Venus) because of circumstances in life. Because of this tough decision to abandon his spouse, Shri Ram’s image in the world rose again as an Ideal King who considers all equal in front of law. At the same time the Saturn is exalted 7th L from A10 ( his kingship). So it made his kingship shine more as an ideal ruler. 8. Great suffering on account of this separation all through his life, then after. His decision to not to marry again. He continued all his religious duties/ yagas/ prayers with a statue of his consort. The chastity of a person and his heart is seen from 4th House. The forth lord Venus is exalted in 9th house linking his happiness directly connected to righteousness (9th H of Dharma). Such a person is liked by all as he is happy doing what is right according to law (9th H) making Shri Ram a very chaste pious and virtuous personality. More over exalted Sun is there in the 3 Arduhas ( AL, A7, UL) making them inseparable. Lord Shri Ram was born on Navami tithi, ruled by Sun. Tithi lord is analysed to see the quality of relationships person has in life. Tithi has to do with emotions and feelings and hence it is jala tatwa by definition. Tithi lord is best in Jala tatwa rashis (water signs: Cancer, Scorpio and Pisces) its placement in Agni tatwa signs is considered bad because agni and jala are enemy by nature. Agni burns away the water and hence the relationships die out in life. Also exalted Sun brings a lot of idealism in relationship. In spite of knowing that mother Sita was completely chaste and pure, lord Shri Ram let her go as it was right according to social and legal norms of that time.